Everyday many of us spend countless hours in conference rooms at work reviewing projects, planning documents and discussing the status of work. It’s a really dated process based on a cobbling together of legacy hardware and software integrations. What’s wrong with this picture? …Well, quite a bit actually. For one thing, it’s not easy to read things that are projected from a computer to a television or large screen which typically has a totally different resolution. TVs and projectors are not optimized for text and thus when screen-sharing from a computer text ends up looking small and fuzzy. It’s almost never easy to read. Additionally the process introduces several steps that add visual clutter: the computer’s application dock or start menu is usually visible on the bottom of the screen and often a menu or status bar will be visible at the top of the screen. The web browsers we use to host most of our work documents and planning tools introduce additional clutter in the form of tab bars, bookmarks and address bars. Then there are the inevitable distractions and interruptions that sharing from your computer can create; everything from meeting reminders popping up to email alerts and chat messages. If you visit any conference room, in just about any office, you’ll almost certainly see a large, flat-screen display on the wall. Many of these conference rooms also have Apple TVs — de rigueur for any cool company today. So our team here at Redbooth started to think… what if we started from scratch and thought about the process of sharing information and discussing as a group. How would we do it today, if we had a new, robust platform like Apple TV and could create a dedicated app? Redbooth creates intuitive task management and planning solutions for individuals and teams to move work forward and accomplish great things. Since our customers already have plans and projects set up in our software, we spotted a great opportunity to make their status meetings and project planning experience better. While a TV isn’t the ideal medium for inputting data, what we realized was that planning meetings, particularly the kinds of status updates and progress reviews many of us have to attend frequently, often don’t involve a lot of data input. The conversation is typically limited to the status of tasks, next steps and due dates. For these items, we thought we could find clever ways to handle the essential interactions without creating a cumbersome process. Create a new, purpose built app for Apple TV that could display people’s Redbooth projects in an engaging, highly legible manner that would be fun for people to use in a group setting. Even better if we could make the app useful for individuals who have Apple TVs in their homes and have never considered using a planning or collaboration tool like Redbooth before. We went through a lengthy process to refine and validate our ideas, something we’ll detail in a subsequent post, but suffice to say we think that the final product is a groundbreaking step for team planning, project management and status review meetings conducted in a group setting with a TV or large screen. 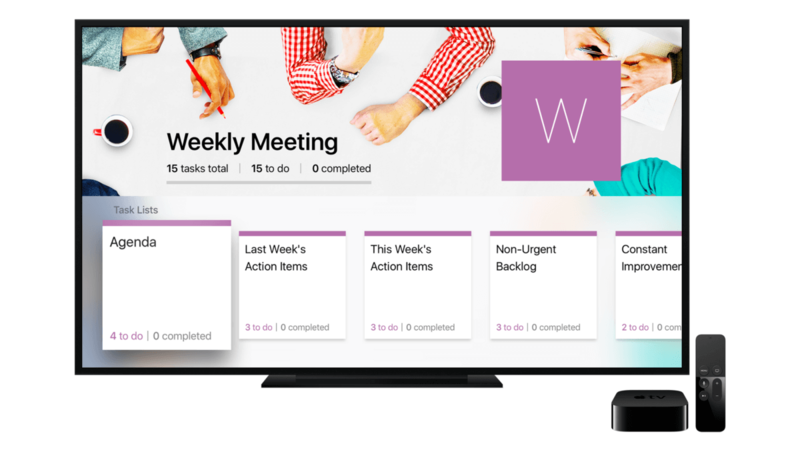 Redbooth for Apple TV — a great way for companies and individuals to plan quickly and intelligently. Choose from a wide array of free planning templates or login to your Redbooth account to view and update your existing projects. You can easily navigate within a project to your lists of tasks. And review anything in a beautiful interface that is easy to read and fun to use. As your team discusses a project, tasks can be marked complete, due dates can be assigned or modified and urgent flags can be added. Deeper changes such as editing a task description can be performed easily with Redbooth’s site or any of our mobile apps which will sync almost immediately with the TV interface. Because data input wasn’t going to make a lot of sense from the TV — and because we wanted to capture and inspire users with the potential of the platform, we decided to create a collection of free project templates that users can browse and add directly from the app. From running effective meetings to on-boarding new employees — there are tons of great templates for work — and awesome plans for organizing family, fun and your future. We’re thrilled with the new app and can’t wait to see what people do with it. Once you’ve tried planning or reviewing the status of a project with the Redbooth app, you’ll never want to go back to spreadsheets or screen-sharing again. We think the results are obvious, beautiful and highly readable. Put down those glasses and enjoy discussing work again. A big thank you to the entire team at Redbooth which worked on this app — without you this groundbreaking idea would never have become a reality. A huge thanks to the amazing Annie Du who created the initial design concept, the incredibly talented and tireless Sarah Tanner for her countless hours working, re-working and re-working again our designs until they were perfect, our fearless iOS engineering team who put in a lot of late nights – Fernando García Bernal, María Bernis, Saül Baró Ruiz and Xavi Gil, our intrepid QA Roc Itxart, our zen like project manager Bimal Ghundhu and last, but not least — our incredible video producer Jon Gómez de la Peña. Also a big thank you for all our friends and supporters outside of Redbooth — you know who you are and we appreciate your help enormously. This article originally appeared on Medium. Read more about Redbooth for Apple TV in TechCrunch and Mashable.